My "making process" is kind of hard to unlock, because I am not a creative person. I don't have a million ideas bubbling in my brain, waiting to surface at any moment. What I'm good at is taking disparate pieces and finding the ways that they fit together. "Finding the pieces in Oz that I could turn into a game" is how I would describe how I came up with Adventures in Oz. 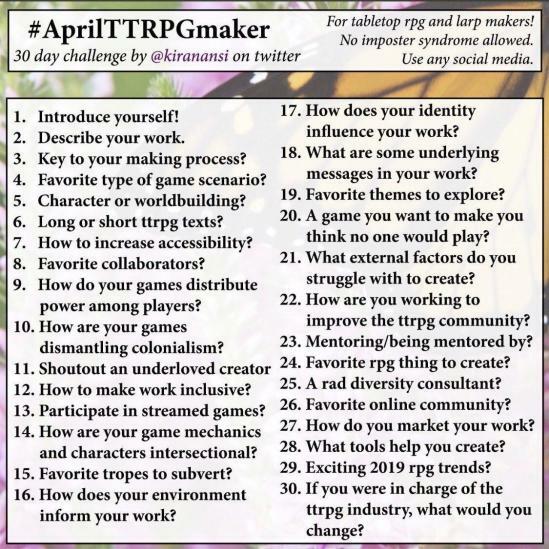 One of my most memorable RPG campaigns was the result of a "random GURPS book challenge." Since Steve Jackson Games has published a ton of supplements for their GURPS system discussing a variety of topics, the idea was that a person could build a campaign by taking two random subjects that they've covered and merging them together. The two that I wound up with were Atlantis and Mars. It resulted in a world where something like H.G. Wells War of the Worlds happened to a technomagical society much like some visions of Atlantis. 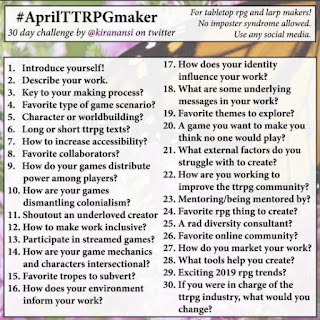 #AprilTTRPGMaker Day 1: Introduce Yourself!